If you have a committed yoga practice, you likely have some familiarity with meditation. It may be in the form of a short guided meditation in class, or you may have a dedicated independent practice. However, the concept of Yoga Nidra isn’t as commonly known—and it may be the missing piece you need in order to find a new level of complete relaxation. Yoga Nidra is a meditative method which helps the practitioner reach complete mind, body, and emotional relaxation. It is commonly practiced with the help of a guiding voice, either through a recording or in person. In Sanskrit, the term nidra means sleep. Often performed in corpse pose (or savasana), the practitioner may appear to be asleep to the outside observer. However, in Yoga Nidra, you remain awake, although in a deeper state of consciousness. While in traditional meditation you are in a waking state, in Yoga Nidra, you go into what is referred as a “psychic sleep”, or a conscious deep sleep. Through the practice, you transition from a waking state to a hypnagogic state, which is between the waking and dream states. From there, you transition to dream and sleep states with full awareness. This conscious yogic sleep allows you to fully turn your attention inwards. The Yoga Nidra that is practiced today has its roots in Sankhya, a philosophy that was first put to paper around 700 BC. These teachings were practiced and expanded upon over the years to follow. The concept of Yoga Nidra as a meditative practice started appearing in yogic texts around the 11th and 12th centuries. The authors started to reference the physical component of the practice, recommending the practitioner lie down in savasana while practicing this meditative state, which is typically how Yoga Nidra is practiced today. In these texts, the term “yoga nidra” was used to as a synonym for samadhi, a deep state of meditation, otherwise known as yogic sleep. The Yoga Nidra technique as it is commonly known today was developed by Swami Satyananda in the 1960s. He built upon the teachings and practices mentioned above to create a practice that was more widely accessible, so that people unfamiliar with yogic texts could still benefit from this meditation. His version allows practitioners to find deep relaxation while also heightening their self-awareness. While the specific practice may vary from teacher to teacher, the guided meditation will include around eight stages, in which the practitioner draws their attention inward as they follow the instruction of the guide. 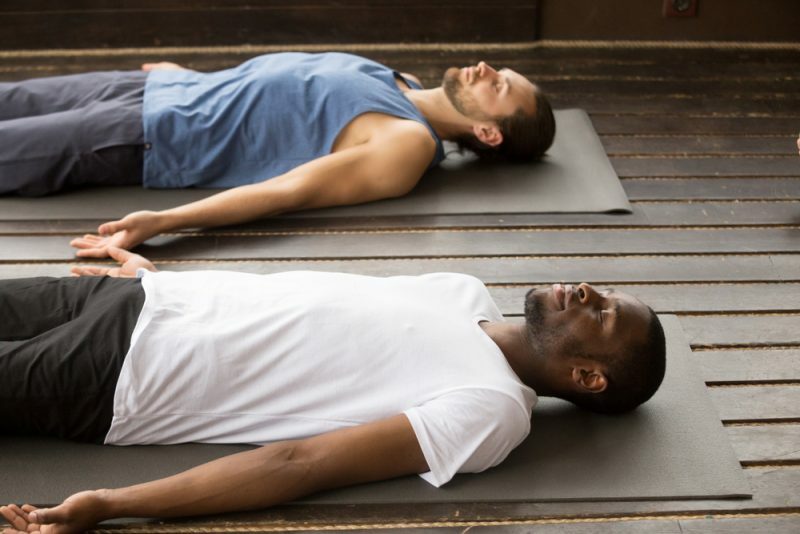 Yoga Nidra can be practiced in a class or by listening to recorded audio, and can vary in length, although it will typically be around 30 minutes to an hour. In this stage, the practitioner gets settled in their space. They get completely comfortable by lying in savasana, and let go of any tensions or fidgets. They start becoming aware of their body as they relax into stillness, and turn attention to their breath. Practitioners take this time to set an intention, known as a sankalpa, for the practice. Kalpa translates to “vow”, while san refers to a connection with one’s highest truth, so the word roughly means “a vow and commitment we make to support our highest truth”. Dr. Richard Miller, creator of a Yoga Nidra method called iRest, explains that sankalpa can take on two forms. The first is the “heartfelt desire”, or a statement that can describe your true nature. The second is a more specific intention that will help lead you on the right path of achieving a goal you have set. Regardless of the type of sankalpa you set, it should be said in present tense, as if it has already been achieved. Some examples are: “I am patient”, “I am at peace”, “I release fear”, “Creativity flows through me”, or “I feel relaxed and centered”. The teacher will instruct the practitioner to bring awareness to different parts of the body. While the practitioner is putting their focus on each part of the body in a rapid manner, they are instructed to remain relaxed and unmoving. A specific rotational sequence is followed during this section. They start from the right side of the body, from the hand and moving down to the foot, and then do the same on the left side. They then move to the back of the body, from the heels to the head, and finally move to the front side, from the top of the head to the feet. In this section, the practitioner will simply turn their awareness to their breath, without any attempts to change it. They may be instructed to start counting their breaths, counting down on each exhale. Next, the practitioner will be guided to imagine sensations that oppose each other, such as hot and cold or love and hate. This can help strengthen willpower and further their level of relaxation by completely focusing on these differing sensations. The practitioner brings their awareness to a space in front of their closed eyes, which is known as the chidakasha. Here, they are told to visualize certain images or situations, at the discretion of the teacher. At this stage, they are led back to the sankalpa they set at the beginning of the practice to reinforce their intention. At the end, the practitioner is calmly guided out of their meditation. They bring awareness back to their breath, and start to notice the environment around them. They are instructed to slowly bring movement back into their body, and sit up when they feel ready. Enhanced Sleep Quality: Yoga Nidra has long be touted as an excellent tool for getting a better night’s rest. In more recent years, this claim has been studied in the context of insomnia sufferers. Researchers found that the practice can in fact help those suffering with sleep disorders fall asleep with more ease. Many practitioners also assert that a middle of the day session can be used in place of a power nap to boost energy levels. Decreased Stress and Anxiety: A study of a group regularly practicing Yoga Nidra found that, over the course of six months, the practitioners had a decrease in both their stress and anxiety levels, while another study found similar decreases of stress levels in multiple sclerosis and cancer patients. Reprogrammed Negative Thought Patterns: By using a sankalpa, a Yoga Nidra practice can help a practitioner adjust negative thought patterns, so that they approach their day and life with a more positive and productive outlook. If you choose to do a Yoga Nidra practice at home, there are a few guidelines you can follow to have a successful practice. Find a Relaxing Environment: Be sure to create a comfortable and relaxing space for your Yoga Nidra session. The aim of the meditation is to feel at ease, so you want to be sure your environment reflects that energy. Find a space that is free of clutter, where you can also dim lights or close the shutters so you don’t feel overstimulated. Before the practice, ensure you turn off the ringer on your phone so you aren’t abruptly taken out of the meditation. Create Comfort: Prior to the start of your practice, think of anything that may enhance your comfort while you are practicing. You’ll likely want to lie on a yoga mat to give your back some cushion. If you are in a colder environment, you may also want to use a blanket, especially since your body temperature may drop in the stillness. If you find it hard to lay in savasana for an extended period, you can use pillows for under your head or knees. You want to ensure you are fully present in your meditation, so don’t allow any discomforts to take you away from your practice. Let Go of Time: You want to be fully present in your practice, and worries about finishing your practice by a certain time can easily take you out. If you have a limited amount of time for your practice, set a timer for five or ten minutes after your session is set to finish. That way, you can fully turn inwards and not think about where you have to be after the session. If you accidentally fall asleep, you’ll have the timer to bring you back. Be Kind to Yourself: The first few sessions of Yoga Nidra can be challenging. You may find your thoughts drifting away from the guided voice, or you might even fall asleep. If the practice doesn’t go as successfully as it could have, don’t be hard on yourself. Know that the practice can be difficult, but you’ll find yourself improving over time. Note: This is an excellent library of downloadable MP3s from various teachers. Each gives a brief description of the recording so you can decide what sounds intriguing to you. If you want guidance in another language, they have recordings for 18 different languages as well. We don’t often get a chance to turn our awareness inward and spend time away from outside influences. Yoga Nidra allows practitioners a unique opportunity to explore our consciousness in a way that many people never experience.